Jimmy Fallon sat down with Savannah Guthrie Thursday night to talk Emmys, "Late Night" and, of course, new baby Winnie. 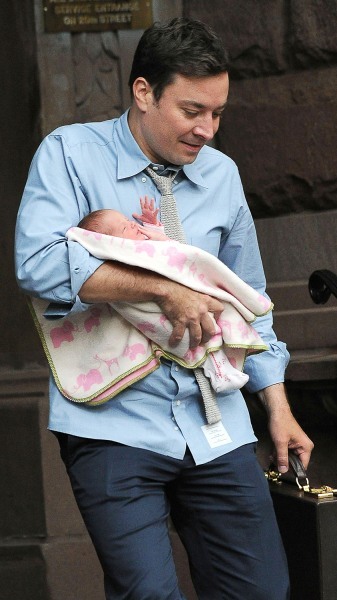 Jimmy Fallon departs his Manhattan residence with his adorable baby girl Winnie Fallon. Fallon revealed in the emotional sit-down that he and his wife, Nancy Juvonen, used a surrogate to have their first child, Winnie Rose Fallon. "My wife and I had been trying a while to have a baby," Fallon told Guthrie. "We tried a bunch of things – so we had a surrogate." Many who work with Fallon, including the TODAY anchors, didn't know he was expecting until the announcement of the birth. “We said, ‘We’re not going to tell anybody,’” Fallon explained. “It’d be just more fun if it’s just private between me and my wife. And then we get to introduce her to everybody." That introduction finally came when little Winnie arrived on July 23, the day after the royal baby was born. “She’s our royal baby around here,” Natalie Morales said of the little girl. “Princess Winnie,” Al Roker added. Fallon stopped by the TODAY plaza Friday morning to talk about the interview, which included a debaucherous game of "Rock, Paper, Scissors, Pie" with Guthrie. After wrapping the game, Guthrie, who's naturally clumsy, took a spill. "Gosh that fall was one of the funniest things," Fallon laughed. "I’m so happy they kept rolling." "Late Night with Jimmy Fallon" is nominated for an "Outstanding Variety Series" Emmy; it's the program's last chance at a win before Fallon steps in to host "The Tonight Show Starring Jimmy Fallon" next spring. And while the nomination and Guthrie’s spill were the main topics of conversation on Friday, Fallon couldn't stop gushing over little Winnie.